A federal grand jury in Virginia has indicted James Alex Fields, Jr. on thirty counts, accusing him of committing a hate crime that led to the death of a woman during the "Unite the Right Rally" last August in Charlottesville, Virginia amongst other crimes. The indictment alleges Fields killed Heather Heyer after driving into a crowd of people protesting racial and other forms of discrimination. Fields is also charged with "28 counts of hate crime acts causing bodily injury and involving an attempt to kill," according to the Department of Justice. Attorney General Jeff Sessions said Fields’ indictment should be a warning to those contemplating hate crimes. "Today’s indictment should send a clear message to every would-be criminal in America that we aggressively prosecute violent crimes of hate that threaten the core principles of our nation," he stated. On the night of Friday, Aug. 14, white nationalists and supremacists rallied in Charlottesville, marching in a torchlight procession and chanting slogans such as "Blood and soil!" and "Jews will not replace us!" Counter-protesters quickly gathered to challenge the marchers, and violence ensued. The following day proved more violent. A combination of white nationalists, many of whom had guns, and counter-protesters, including members of the group "Antifa," gathered in close proximity to one another. Fighting broke out once again, with both sides punching, swinging sticks, and spraying chemicals. 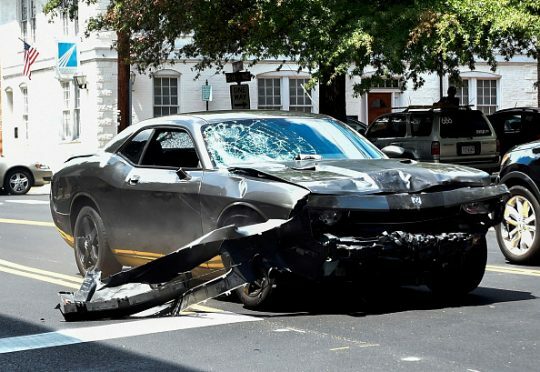 In the midst of the Saturday chaos, the Justice Department said Fields drove his car into a crowd of counter-protesters, killing Heather Heyer and injuring over a dozen people. Authorities say he fled the scene before being arrested later in the day. "Hatred and violence have no place in our communities," FBI Director Christopher Wray said in response to the grand jury’s decision. "The investigation of hate crimes is a top priority of the FBI, and we will continue to work with our partners to ensure those who perpetrate such despicable acts are held accountable." This entry was posted in Issues and tagged Charlottesville. Bookmark the permalink.